Cherubism is a rare, non-neoplastic, hereditary disorder of children and adolescents, characterized by painless mandibular bilateral swellings' that cause fullness of the cheeks, firm protuberant intra alveolar masses and missing or displaced teeth. Radiologically, it presents as multilocular radiolucencies involving the mandible and/or maxilla and has a characteristic histopathological appearance. It progresses until puberty and shows a partial or complete involution in adulthood. A 7 year old male child was brought to the hospital by his parents for bilateral painless swellings involving the lower jaw, of 8 months duration, in 1998 for the first time. The swellings were gradually increasing in size. There was no significant past medical history [Figure 1]. His younger sibling was normal, and there was no family history suggestive of a similar complaint. On extra-oral examination, there was swelling of both rami of the mandible and a palpable sub-mandibular lymph node on the right side. X-ray revealed well defined multilocular radiolucencies involving the posterior body of the mandible and ascending rami with displaced teeth. Maxillary lesions could not be identified. Biopsy was sent from the jaw swellings and the lymph node was excised. Histopathology revealed spindle cell stroma interspersed by multiple osteoclastic giant cells distributed uniformly throughout the section. Also present were multiple small vessels [Figure 1]a. Perivascular cuffing with eosinophilic material was noted in focal areas. Sections from the lymph node revealed nonspecific reactive changes. The possibilities considered were cherubism, central giant cell reparative granuloma and brown tumors of hyperparathyroidism. Biochemical investigations for serum calcium, phosphorous and alkaline phosphatase levels were found to be within normal limits. A diagnosis of cherubism was made and the patient was kept under follow up with no further surgical intervention. Over a period of five years, the child developed nasal obstruction and malocclusion of teeth [Figure 2]. A Computed tomography (CT) scan revealed further progression in the size of the lesion [Figure 2]a. Surgery was done to relieve the obstruction and the material sent for histopathological examination (HPE) revealed the same picture. Dental malocclusion was partly corrected by extracting few teeth. Latest review showed a visible regression of the lesion with a change in facial contour [Figure 3]. The patient is under follow up till date. Cherubism is a rare familial, autosomal dominant genetic disorder characterized by 100% penetrance in males and 50- 75% penetrance in females, and a great variation in clinical expression. A new mutation with reduced penetrance in males has also been identified. It usually presents as bilateral swellings but cases with unilateral involvement have also been reported. Clinically, affected children are normal at birth and are without any evidence of disease till 14 months to 3 years of age. 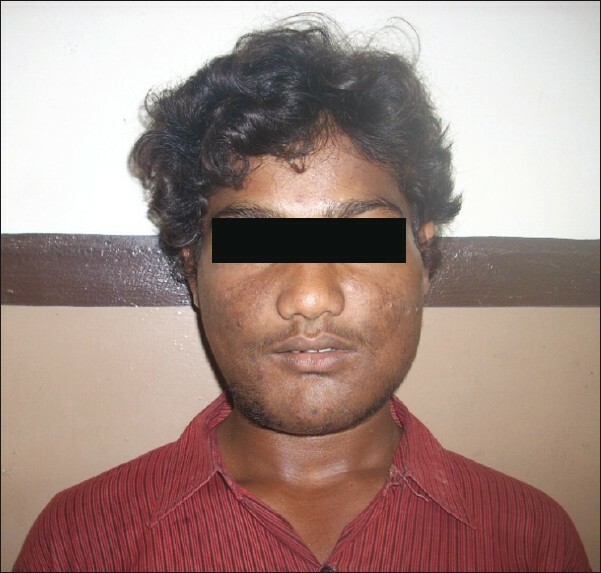 Symmetric enlargement of the jaw begins after this age, and progresses till 12-15 years of age. At puberty, the lesion begins to regress and remodeling of the jaw continues up to the third decade of life by which time the abnormality usually becomes indiscernible. ,, Signs and symptoms of the disease vary in severity and range from undetectable lesions to grossly distorting maxillary and mandibular swellings causing impairment of speech, swallowing and respiratory problems. The jaw lesions are firm and non-tender. They begin at the angle of the mandible and extend into the ramus and body with or without involvement of the maxilla. Involvement of the maxillary ridge gives rise to a "V" shaped palate and orbital encroachment leading to an "eyes to heaven" appearance. Cervical lymph nodal enlargement caused by reticulo-endothelial hyperplasia is usually an associated feature and this contributes to the patient's full-faced appearance. The lymph nodes are enlarged before 6 years of age and decrease after 8 years of age. Different types of dental abnormalities ranging from delayed eruption, displacement of teeth to tooth resorption are known to occur. The radiographic appearance is characteristic with bilaterally symmetrical well defined multilocular radiolucencies in the mandible. Maxillary involvement is less frequent and less extensive. A radiological grading system has been proposed by Arnott based on the location of the lesion and degree of expansion, which, in a given individual may change depending on the findings at follow up examination. Such variation in grading was observed in our case during follow up. A histological sub typing was proposed by Penarrocha et al. taking into consideration the predominance of giant cells, inflammatory activity, hemorrhages and fibrosis. They found an aggressive disease behavior in a case having increased density of giant cells, but further studies are needed before such a correlation is proven. Mutations in the exon 9 of the SH3 domain binding protein 2 (SH3BP2) gene on Ch 4p band 16.3 have been identified in many families with cherubism. Non-familial cases may also be due to new mutations. ,,,, These mutations lead to the development of multiple cystic giant cell lesions in the jaw bones in early child hood with stabilization and resorption after puberty. Signals unique to mandible and maxilla, triggered by the eruption of secondary teeth and transmitted throughout the extra cellular matrix are thought to be responsible for the organ specific changes seen in cherubism. So far, no disease causing mutation outside exon 9 in the SH3BP2 gene has been identified, making it specific for the diagnosis of the disease. The treatment is based on the known natural course of the disease and the clinical behavior of the individual case. It ranges from masterly inactivity to recontouring for relieving complications/cosmetic purposes. Therapy with calcitonin has been said to reduce the need for surgery by inducing bone resorption. 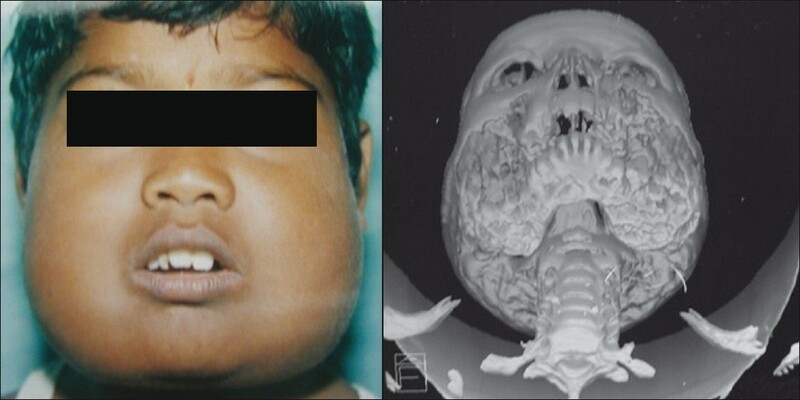 In conclusion, this is a case of Cherubism showing the classical sequence of progression, complications, and involution which are the main characteristics of the disease. 1. Hamner JE 3 rd , Ketcham AS. Cherubism: An analysis of treatment. Cancer May 1969;23:1133-43. 2. de Lange J, van Maarle MC, van den Akker HP, Redeker EJ. A new mutation in SH3BP2 gene showing reduced penetrance in a family affected with cherubism. Oral Surg Oral Med Oral Pathol Oral Radiol Endod 2007;103:378-81. 3. Ongole R, Pillai RS, Pai KM. Cherubism in siblings: A Case report J Can Dent Assoc 2003,69:150-4. 4. Jain V, Gamanagatti SR, Gadodia A, Kataria P, Bhatti SS. Non familial cherubism. Singapore Med J 2007;48: e253-7. 5. Lannon DA, Early MJ. Cherubism and its charlatans. Br J Plast Surg 2001;54:708-11. 6. Peñarrocha M, Bonet J, Mínguez JM, Bagán JV, Vera F, Mínguez I. Cherubism: A clinical, radiographic and histopathologic comparison of 7 cases. J Oral Maxillofac Surg 2006;64:924-30. 7. Lo B, Faiyaz-Ul-Haque M, Kennedy S, Aviv R, Tsui LC, Teebi AS. Novel mutations in the gene encoding c-Abl binding protein in SH3BP2 causes Cherubism. Am J of Medical Genetics 2003;121:37-40. 8. Mangion J, Rahman N, Edkins S, Barfoot R, Nguyen T, Sigurdsson A, et al. The gene for cherubism maps to chromosome 4p16.3. Am J Hum Genet 1999;65:151-7. 9. R A Cawson, E W Odell. Cawson's essential of oral pathology and oral medicine 8th ed United Kingdom: Churchill Livingstone Elsevier; 2008. p. 175-7. 10. Southgate J, Sarma U, Townend JV, Barron J, Flanagan AM. Study of the cell biology and biochemistry of cherubism. J Clin Pathol 1998;51:831-7.